To keep up with life, you have to take care of yourself, and supporting your immune health is an important part of that. Your immune and digestive systems are closely related. In fact, 70% of your body's immune system is located within your digestive tract. Align Daily Immune Support helps fortify your digestive system with healthy bacteria and supports a balanced and healthy immune system*. Align Daily Immune Support contains the probiotic strain Bifidobacterium lactis, BB-12, which is a registered trademark of Christian Hansen. <br /> <br />*THESE STATEMENTS HAVE NOT BEEN EVALUATED BY THE FOOD AND DRUG ADMINISTRATION. THIS PRODUCT IS NOT INTENDED TO DIAGNOSE, TREAT, CURE, OR PREVENT ANY DISEASE. To keep up with life, you have to take care of yourself, and supporting your immune health is an important part of that. Your immune and digestive systems are closely related. In fact, 70% of your body's immune system is located within your digestive tract. 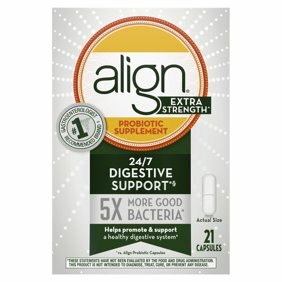 Align Daily Immune Support helps fortify your digestive system with healthy bacteria and supports a balanced and healthy immune system*. Align Daily Immune Support contains the probiotic strain Bifidobacterium lactis, BB-12, which is a registered trademark of Christian Hansen. Dosage: Take one capsule per day. For best results, we recommend you store this product in the original blister package. Instructions: Take one capsule per day. Store at room temperature. For best results we recommend you store Align in the original blister package. Great Probiotic- no need for fridge!